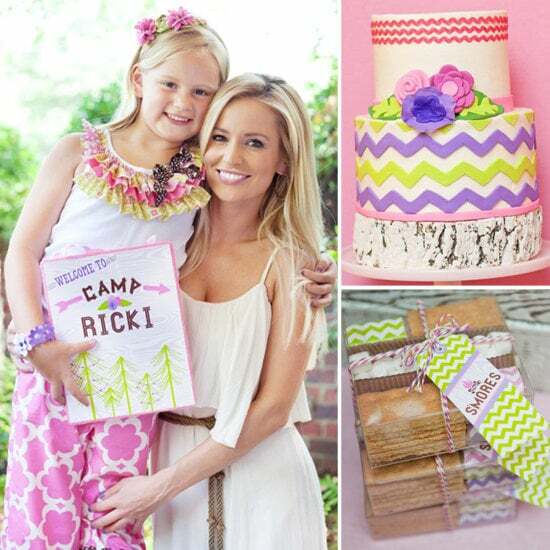 The Bachelorette Emily Maynard is a supermom, and she didn't let her suddenly extremely public persona stop her from throwing an incredible, girlie camping birthday bash for her daughter, Ricki. The talented gals of Anders Ruff got together with Emily to create a creative, sweet glamping (that's glam-camping for those of you who haven't caught on to the trend yet) party. Complete with a gorgeous cake and on-theme sweets (the individual trail-mix containers and take-home s'mores are just two of many standout components), girlie paper goods from Anders Ruff's printable collection, and lots of stylish details (including, of course, an awesome tent), Ricki's party is positively lovely — and nope, there wasn't a rose in sight.